Current estimates are that over 150 million Americans viewed the great American solar eclipse on August 21, 2017 with another 60 million viewing it electronically from TV or the internet. It’s amazing to think that we are still using this opportunity to do new and exciting science even though eclipses are a regular occurrence. 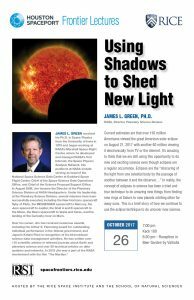 Eclipses are the “obscuring of the light from one celestial body by the passage of another between it and the observer…” In reality, the concept of eclipses in science has been a tried and true technique to do amazing new things from finding new rings at Saturn to new planets orbiting other far away suns. This is a brief story of how we continue to use the eclipse technique to do uncover new science. JAMES L. GREEN, PH.D., received his Ph.D. in Space Physics from the University of Iowa in 1979 and began working at NASA’s Marshall Space Flight Center, where he developed and managed NASA’s first Internet, the Space Physics Analysis Network. His positions at NASA include serving as head of the National Space Science Data Center at Goddard Space Flight Center, Chief of the Space Science Data Operations Office, and Chief of the Science Proposal Support Office. In August 2006, Jim became the Director of the Planetary Science Division at NASA Headquarters. Under his leadership at the Planetary Science Division, several missions have been successfully executed, including the New Horizons spacecraft flyby of Pluto, the MESSENGER spacecraft to Mercury, the Juno spacecraft to Jupiter, the Grail A and B spacecraft to the Moon, the Dawn spacecraft to Vesta and Ceres, and the landing of the Curiosity rover on Mars.